Kagero Nikki, translated here as The Gossamer Years, belongs to the same period as the celebrated Tale of Genji by Murasaki Shikuibu. This remarkably frank autobiographical diary and personal confession attempts to describe a difficult relationship as it reveals two tempestuous decades of the author's unhappy marriage and her growing indignation at rival wives and mistresses. Too impetuous to be satisfied as a subsidiary wife, this beautiful (and unnamed) noblewoman of the Heian dynasty protests the marriage system of her time in one of Japanese literature's earliest attempts to portray difficult elements of the predominant social hierarchy. 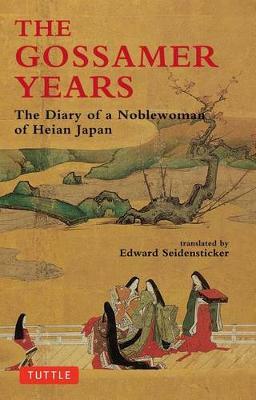 A classic work of early Japanese prose, The Gossamer Years is an important example of the development of Heian literature, which, at its best, represents an extraordinary flowering of realistic expression, an attempt, unique for its age, to treat the human condition with frankness and honesty. A timeless and intimate glimpse into the culture of ancient Japan, this translation by Edward Seidensticker paints a revealing picture of married life in the Heian period.